The 19th century Cathedral of the Assumption of the Virgin is an imposing landmark at the city center, which contains a finely carved iconostasis and bishop’s throne, some interesting murals and stained glass. 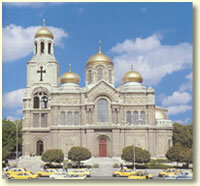 The cathedral is one of Varna symbols. You can enjoy the splendid view from the bell tower but you have to climb up the narrow and spiral staircase of 133 steps. It was Prince Alexander Battenberg who placed the first stone in the foundations of the construction starting on 22 August 1880. The design was made by Maas, an architect from Odessa. The building was completed in 1886 but its consecration was delayed until 1910. 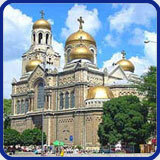 Varna is a world famous venue for congresses, conferences, scientific and business forums. There are multifunctional halls and modern hotels is the city and the beach resorts north of Varna. They offer various services and facilities – modern equipment for simultaneous and consecutive translation, highly qualified specialists, catering cocktail parties, hotel accommodation and a package of tourist services. It is the only dolphinarium on the Balkan Peninsula and it is one of the greatest attractions that Varna can offer to its guests. The show lasts 40 minutes. The visitors will enjoy the incredible intelligence and playfulness of the sea mammals. 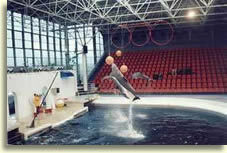 A curious fact is that in 1992 a baby-dolphin was born in the Dolphinarium in Varna. The event was a sign that the animals feel at home in their surrounding. The Palace of Culture and Sports is another venue for many business and scientific meetings and prestigious international sport events. Its Congress Hall can seat 3000 persons. There are 9 other halls seating from 50 to 800, air-conditioning, 10 cafes, a post office, a recreation centre, shopping area and a parking lot. The unique architecture of the Palace and the great number of visitors of cultural and sport events make it desirable place for advertising and trade. Anually business forums of national importance are held here such as the fair of “Tourism and Leisure Time”, “Made in Bulgaria”, “The Three Keys – Home, Office, Villa”. 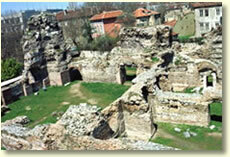 They date back to the time when the region was a part of the Roman Empire and the settlement was called Odessos. The preserved parts of the building give grounds to believe that the roman Baths were one of the largest buildings in the eastern part of the Empire and a proof for the wealth and importance of the town. The height of the domed construction is supposed to have been no less than 20 m. The building was constructed in the second half of the 2ndcentury on an area of about 7000 square meters and was in use until the end of the 3rd century. Its thick walls were blocks with 5-6 layers of solid clay bricks.